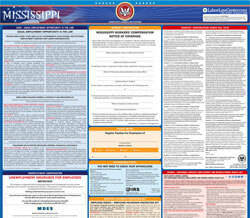 The Unemployment Insurance Poster is an unemployment law poster by the Mississippi Department Of Employment Security. This is a mandatory posting for all employers in Mississippi, and businesses who fail to comply may be subject to fines or sanctions. It appears you don't have a PDF plugin for this browser. Please see the link below to download mississippi-ui-insuranceforemployerltrsizesign1013update.pdf. in case you become unemployed through no fault of your own. Nothing is deducted from your pay to cover its cost. WIN Job Center for work search assistance. and services available upon request to those with disabilities. the Mississippi Department of Employment Security.